If NASCAR Next member Hailie Deegan‘s last name sounds familiar, then you’re probably a student of all kinds of motorsports: her father is Brian Deegan, the most decorated freestyle motorcross rider in XGames history who also raced in Global RallyCross and the Lucas Oil Off Road Racing Series. Learn more about the “Dirt Princess” in this week’s Fast Facts. 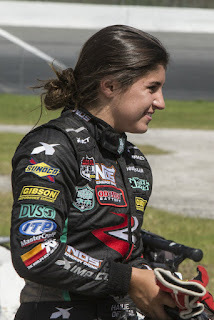 Hailie Deegan was born July 17, 2001 in Temecula, CA. She began racing at age 8 in off-road trucks, and progressed through a number of off-road series. Deegan was the first female competitor to win a race and a championship in the Lucas Oil Off Road Racing Series. In 2015, she was the Lucas Oil Mod Kart Regional champion, which she followed up one year later as the overall Mod Kart champ. For 2017, she was the youngest competitor in the Pro Lite category. 2016 also began a new adventure for Deegan, as she was part of NASCAR’s Drive for Diversity combine. In 2017, she was named the youngest member and only female member of the NASCAR Next class, and ventured into Late Model and Super Late Model racing during the season. Deegan, who is a member of Toyota’s driver development program, recently announced a partnership with Under Armour and their #ShePlaysWeWin campaign. Both she and her father are Monster Energy athletes. Learn more about Hailie Deegan on her Facebook page.